It is true that narcissists and codependents can find themselves irresistibly attracted to each other with dysfunctionally disastrous results. This specific combination can create a toxic cycle of behavior and psychological abuse that can go on for a lifetime unless there is some kind of shift in awareness or a pattern interrupt. 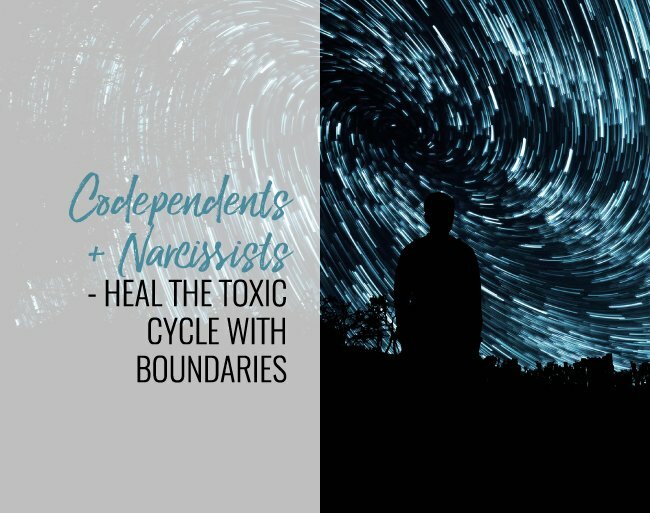 In today’s episode, I am proposing that solid boundaries can end the cycle of stress, pain, and anxiety that goes hand in hand with a narc/codependent union. So let’s start with why this particular attraction is so compelling and seductive. It is a seemingly perfect fit because narcissists and codependents comprise two halves of a perfectly dysfunctional whole. You have the narcissist who’s the self-focused taker and controller, and the codependent who’s the other-focused giver and fixer. The narc wants it to be ALL about get their needs wants and desires met and the codependent is on board for that as well. Keep in mind, narcissists can be incredibly charming. They can swoop into your life and sweep you off your feet. You can feel a connection that you’ve never felt before, as if someone finally gets and see you. They may make grand romantic gestures and make you feel incredibly special with flattery and promises of future adventures. This behavior is sometimes referred to as “love bombing.” Once the narcissist knows they have you hooked, the adoring behavior slowly but surely starts to be replaced with disdain and criticism. Now the toxic cycle is starting to come into view. The question is how can boundaries help? For clarity, the cycle for the codependent goes from being in favor to being out of favor to working to get back in favor. It’s as if the codependent is in a perpetual state of “chasing the high” of the beginning of the relationship, which of course is never coming back and wasn’t completely real to begin with due to the narc’s ulterior motives. A narcissist needs what is referred to as their narcissistic supply which comes from the codependent (and others). This is a constant source of admiration, attention, approval, and adoration and it is vital for the narcissist to survive, as they use it to regulate their unstable self-worth, self-esteem and sense of self. This toxic cycle of approval and rejection doesn’t leave room for effective problem-solving. There is a silent agreement to act out the unresolved childhood wounds instead of actually working to resolve them. Both parties are trying to protect themselves emotionally. The narcissist is trying to uphold their false self and needs a constant supply to do so. And they’re not just doing this for the outside world optics. This is a desperate attempt to avoid the self-loathing and the deep insecurity that most narcissists feel at their core. The codependent is trying to avoid disapproval and conflict. But the problem is that no matter how much you acquiesce to a narcissist’s wants and desires, the cycle will inevitably continue and avoiding the wrath of the narcissist becomes impossible. Without therapeutic intervention or behavioral dynamic changes, the cycle healing on its own is highly unlikely. If the cycle ends, it is usually because the narcissist moves onto new more enticing supply, abruptly ending the relationship. So how do we bring boundaries into this mix? Awareness, as always, is step one. You must ask yourself, how happy or unhappy are you in this relationship? How satisfied are you in this relationship? Do you feel good? Do you feel terrible? You have to focus on your own needs even if it is a foreign concept to you. The second step is going to be you observing yourself without judgment. Look at the way that you deal with the people in your life, even your friends. When they ask you where you want to go for dinner, do you say, “I don’t care. Whatever you want is good”? I want you to start dialing into observing the way that you’re behaving not just in your romantic relationship but with everyone because if you’re extremely codependent in a relationship with a narcissist, I imagine that you have these codependent behaviors in your other relationships as well. Never asserting your preferences or desires, serves to block you being authentically known. It caps the level of intimacy that you can achieve in your relationships. Also, not prioritizing your preferences, your pleasure, your desires can thwart efforts for a more balanced relationship because you can’t draw boundaries until you know what you want. The third step is to start small (and safe). Start asserting yourself in safe friendships. The next time your friend asks what you want to eat for dinner, tell them instead of saying it doesn’t matter. If your order at a restaurant comes out wrong, nicely send it back instead of just eating it. These small steps will build your confidence to start drawing boundaries in your relationship. I’m including a downloadable cheat sheet for you below to these four steps to make it easy for you to draw boundaries to stop any unhealthy relationship patterns in your life. Understand that when you draw boundaries, you will feel anxious but it will be short lived and the relief and benefits of doing it can be lasting. You don’t have to do it perfectly and you won’t, but you do have to start somewhere if you’re really committed to the cycle ending. Please note: Diagnosable Narcissistic Personality Disorder (NPD) is a pervasive and enduring pattern of self-aggrandizing behavior and attitude. According to the National Institute of Health (NIH) approximately 6.2 % of the U.S. population are afflicted. People who exhibit narcissistic tendencies as opposed to the disorder are more likely to possess the ability to change dysfunctional behavioral patterns. Also, please join me for my Wednesday Wisdom livestreams, where I am breaking down all things boundaries. 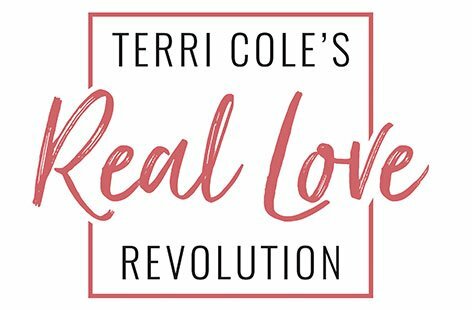 You can join me on my Facebook business page, which is Terri Cole, LCSW (all are welcome) or my all gals only Facebook group, which is called the Real Love Revolution. I would love to see all of you on the next livestream this Wednesday @ 3PM EDT. The Wednesday Wisdom livestream series will go until September 5th. So you don’t want to miss it. We also have our Big Beautiful Boundary Challenge coming up in September so stay tuned for all the details. I hope you have an amazing week and as always, take care of you. OMG! I’ve always considered myself a very independent woman. I kinda knew that I had a tendency to focus on others as a way to avoid dealing with my own stuff. But until I listened to this video …I never would’ve considered myself a co-dependent. An enabler….yes at times…but not a co-dependent! But I totally am a co-dependent! And I totally know this is from childhood because I still have trouble setting boundaries or saying no to my parents in fear of disappointing them! Thank you Soo much. I didn’t see last week’s video…I am going to watch it now. To be honest I watched this one because I felt my ex was narcissistic. Lol. Never even gave it a thought that I was co-dependent. Oh my! Right on, Rebecca! I am so happy the vids are adding some value to your evolution and grateful you’re here with us! I loved your video Terri. Do you have any tips or resources for educating/supporting a young 12 year old girl about how to handle her narcissist /borderline personality disorder, alcoholic mother? This is my niece and it breaks my heart to watch. There’s got to be something to help her. How can I help her? What things would be helpful for me to tell her? Hello. I’m new to all of this. Well, in that It’s only been two days since I’ve come to the conclusion that I’m apparently a codependent and rather than the sad, confused loser I’d been led to believe, am just one of many who’ve had the misfortune of being taken advantage of, used, abused and manipulated women like me. The validation I’ve experienced in the last 48 hours has been overwhelming. A huge, huge relief and sense of empowerment that has turned into a heavy sadness and acceptance that thankfully has also included a drive to understand more and find the support I need to deal with the devastation and loss my ex “boyfriend” has left me with. And that’s all I have left. I met this guy nearly four years ago online after having been separated from my ex husband also my first and only boyfriend I’d had whom I’d been with from the age of 16 and had been with for 26 years. The last four years have been a whirlwind nightmare that left me even more insecure than I’d been with my ex husband in addition to going from an affluent woman in an ocean view home with a brand new car to today where I’m penniless and homeless living in a campground two hours from my children. I suppose I’m writing as part of my process of acceptance & healing & to thank you as one of the many experts on the topic to let you know how life changing it’s been for me to find out I am not the only woman to have been in the kind of abusive, manipulative and utterly devastating relationship like what I’ve experienced with this man whom in addition to NPD also is a homeless addict with a serious paranoid personality disorder. So, thank you for helping me into my path of recovery. I pray that I have the strength to hold on in the coming months. I’m so grateful to have somehow found the strength to make him leave a little over a week ago and pray I don’t succumb to him again. As a codependent I’m struggling enormously with pain and loneliness in addition to being homeless & broke. I know I have a long seemingly insurmountable battle ahead of me. In this moment I feel up to it but I know that can so easily change into a suicidal depression as has been the norm in the past when we’ve separated and I have not only the loneliness but the shame of knowing what I’ve put up with and humiliation that’s compounded by the complete lack of sense of loss this person shows. At least now I’m not tormented with the question of did he ever love or even care for me? Or was I only a pawn & he simply used & took advantage of me? Now I know. He can’t miss me and was never capable of loving me. I desperately hope I’ll never give in to him again as I have so many times in the last four years with that information strengthening my resolve. Knowledge is power! Thank you, thank you, thank you!